Far be it from us to criticize the nation's most celebrated groundhog, but this year Punxsutawney Phil's prediction of 6 more weeks of winter did not come to pass in many parts of the country. Instead, spring sprung earlier than ever, and shows no signs of retreating! Keep an eye on the weather forecast. If frost is predicted overnight, toss a row cover over young seedlings. (An old bedsheet will work in a pinch, but may be too heavy for delicate sprouts.) If late frosts and chills are a regular feature of your climate, consider putting Haxnicks Fleece Tunnel over the most vulnerable young plants. Water early in the day. This ensures that droplets have time to dry, preventing them from freezing on the leaves of your plants. Pamper those early tomatoes! If you're determined to harvest the first tomato on the block, make sure it takes off in style by surrounding the young plants with Kozy Coats. These red plastic teepees fill with water, heating the plants during the day and protecting them during the chilly night. Don't forget bigger plants. If the temperature drops, even established plants or container plantings may be at risk. 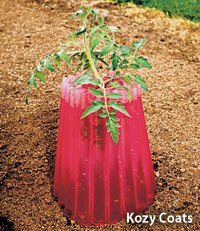 Pop a Collapsible Plant Protector over them to prevent damage! Consider permanent protection. If your growing season is short, if you have a large number of tender plants that you would like to overwinter, or if you simply love getting a head start every spring, consider investing in a portable coldframe. Lightweight and collapsible, you can place it wherever you like, and it will not only protect your tenders and tropicals from winter chills, but also start your new spring garden early and strong! The Environmental Working Group's guide to pesticides in produce identified 12 kinds of fruits and vegetables in American supermarkets that are most likely to have been grown with large amounts of chemicals. These "dirty dozen" include plenty of favorites from our daily diet. So what to do? Well, we can try to buy organic produce.... when we can afford it, and when it is available. But there's a simpler solution for us gardeners — we can simply grow our own! Nearly all of the "dirty dozen" can be grown successfully in most U.S. climates, and with today's more compact varieties, many can even be grown in containers! Give a new fruit or vegetable a try this season, and boost your family's health while having fun in the garden or on the patio! On June 23, 2012, we will welcome gardeners, photographers, and nature lovers from across the country into our gardens in Greenwood, South Carolina. Part of the annual South Carolina Festival of Flowers, Flower Day is a longstanding tradition and our absolute favorite day of the year here at Park Seed! Our 9-acre trial garden will display all the new All-America Selections contenders — a record number this year! 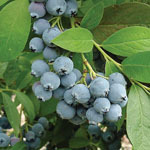 — as well as many of the varieties you have seen in our catalog and on the website. You'll visit our vegetable patch as well as themed plantings such as deer-resistant and drought-tolerant gardens. Our Garden Center will be open, offering terrific bargains on seeds and plants. And of course we'll have food, drinks, garden tours, and other events of interest. It's time to plow up the Pansies and the Kale, our winter mainstays here in the South. If it's been a while since you grew either of these crops, give some newer varieties a try this season. They last longer and look more vibrant than ever before, which is such a treat on those gray February days! Of course, farther north they are spring and fall crops, so you can keep the beauty coming right through Mother's Day! This week we're beginning to sow some vegetable and flower seeds. Spinach, cucumbers, and pumpkins are going into our vegetable patch, while zinnias, marigolds, dahlias, and petunias are filling the sunny annual beds. If you can, please be our guest at Flower Day this year! Admission and all Park Seed events are free, and you're welcome to bring a picnic if you don't want to buy food and drink. (The views from our picnic tables are pretty spectacular!) We'd love to meet you and show you our gardens, so gather the whole family together and make a day of it!